Street (metered) parking in front of the building, and a fee based parking lot at 7th & Clay. We encourage you to take BART. Our office is just a few blocks away from the 12th Street Downtown Oakland station. Our address is 524 7th Street, Oakland, CA 94607 (between Washington & Clay, and directly across the street from the Wiley W. Manuel courthouse, and a few blocks away from the 12th Street Downtoen Oakland BART Station). There is metered street parking in front of the building, a parking lot at the corner of 7th & Clay, and a parking garage at 7th and Jefferson (open Monday - Friday, $1.50 for 1 hour). $20.00 rolling fee per live scan or ink-rolled card. There may be an additional cost for the Government (DOJ/FBI) background processing fees. LPG Live Scan accepts cash, credit/debit cards, money orders and business checks. Personal checks are not accepted. If you were provided a Billing Account Fingerprinting Referral form or a Prepaid Fingerprinting Voucher, the fees may be covered in full by your Employer. Monday – Friday, 9:00 am – 5:00 pm, Appointment is not required. Walk-In for service, typically there is little to no wait and LPG Live Scan does not close for lunch. Saturday, 9:00 am – 1:00 pm, Appointment is recommened, but not required. To make an appointment, click on the desired date and then select "Book It" next to your desired time. Bring a valid Government/State issued photo ID (driver license, state ID, or US Passport). For Live Scan fingerprinting, also bring the Request for Live Scan Service form issued by the organization requesting the background check. 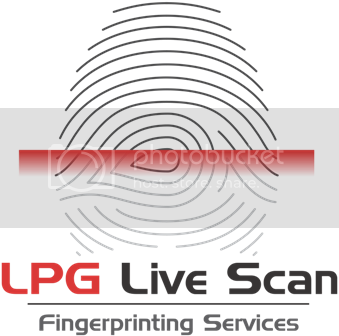 For ink fingerprinting, LPG Live Scan provides the standard FBI Applicant FD-258 card.